This woolly world that spooks and spites you." Come join us for the 4th annual science fiction conference devoted to the life and work of author R.A. Lafferty. This year we will have a panel on Lafferty’s novel The Reefs of Earth, The Gene Wolfe Literary Podcast returns with an in depth analysis of the short story 'Nine Hundred Grandmothers,' and there will be lectures on Lafferty's work and his legacy. In addition, we will offer an art show and free refreshments. LAFFCON is a free event that takes June 8, 2019 in Lawrenceville, NJ. Registration opens Wednesday, May 1st, 2019. 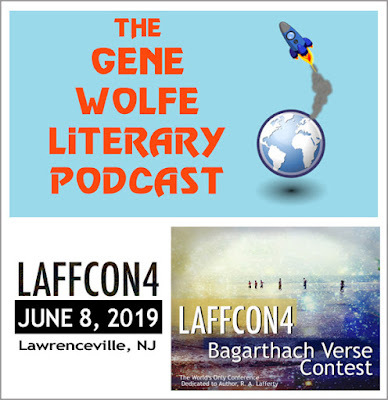 Deadline for the LAFFCON Bagarthach Verse contest is April 25, 2019. Click here for details. Over the years we've had a long and bounteous history of failed attempts to either stream or record LAFFCON. Last year was our most successful thanks entirely to Glen McDorman and Brandon Budda, hosts of The Gene Wolfe Literary Podcast. Also, there is one great recording from LAFFCON1 (2016), a "Lafferty Studies" panel featuring Andrew Ferguson, Gregorio Montejo, Daniel Otto Jack Petersen, and Michael Swanwick. 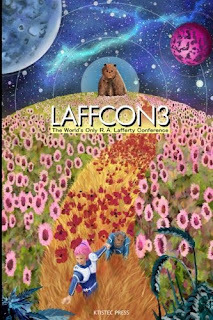 LAFFCON4 takes place Saturday, June 8, 2019. This year we’re jumping out of our chairs giddy at the return of Brandon Budda and Glenn McDorman, hosts of The Gene Wolfe Literary Podcast. They'll be recording a live episode, unpacking one of Lafferty's greatest stories. The Gene Wolfe LiteraryPodcast travels through the works of the great speculative-fiction writer Gene Wolfe one story at a time. Lucky for us they occasionally alter course into other literary universes. Last year they dropped anchor outside LAFFCON with scholar Gregorio Montejo and gave a thorough discussion of the R. A. Lafferty short story ‘Snuffles.’ Brandon and Glenn are solid pros, perfectly comfortable before the mic, insightful and interesting (a quadruple threat to boredom.) Those who were present had the story unpacked bit by bit. Like most Lafferty stories all those bits pile up into quite a bite. -Personally, I can no longer look at a stuffed bear without imagining the big bouncing demiurge. 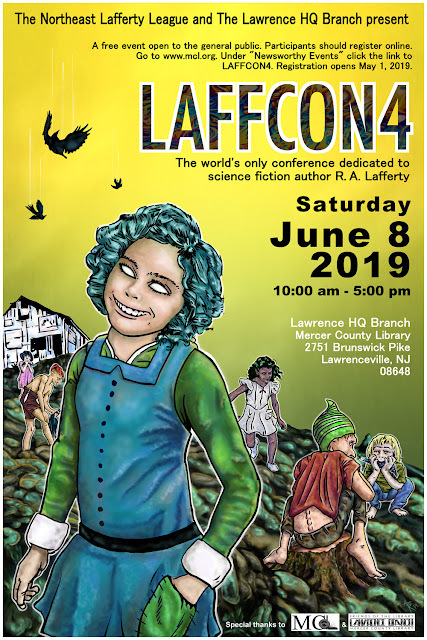 LAFFCON is a free annual conference dedicated solely to the works of author R. A. Lafferty. This year’s conference once again takes place in Lawrenceville, NJ. Also, here is a reminder that the deadline for entry into the first LAFFCON Bagarthach Verse Competition is April 25, 2019. Winners get their curse...er,"verse" printed in the conference program booklet. So give us your most mean-spirited curse of a verse in a style that would make a Puca chortle. For more information about the contest rules click here. 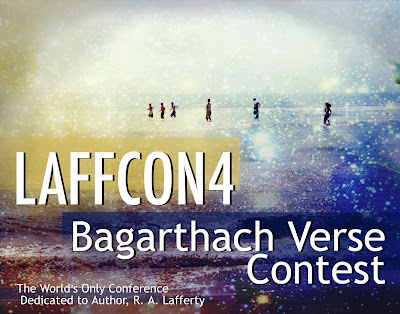 LAFFCON, the world's only conference dedicated to the life and works of author, R. A. Lafferty, announces the first ever Bagarthach Verse Contest. 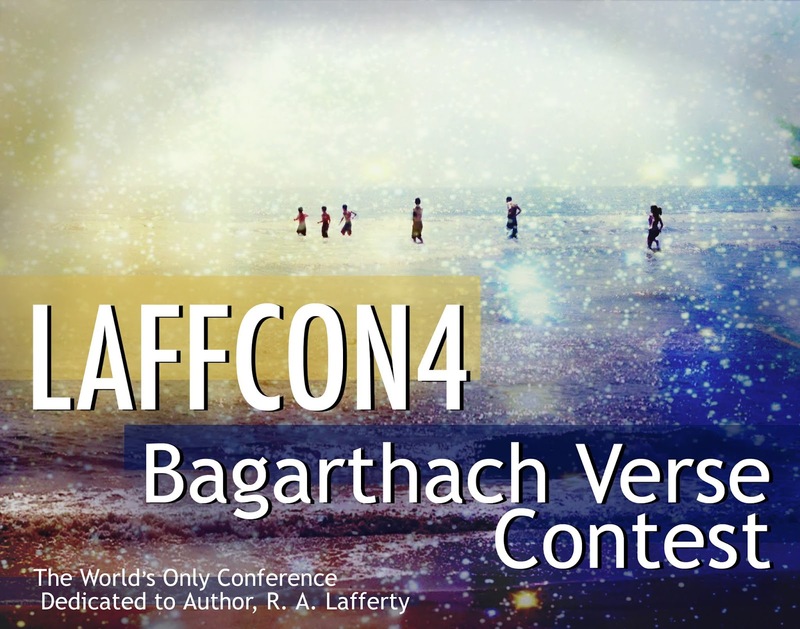 Submit your own Bagarthach Poem and winners will have their verse published in the LAFFCON4 program booklet next to articles and artwork inspired by this year's main theme, The Reefs of Earth. 1. funny or clever but mean spirited. All submissions must be original works. No limit to the number of submissions. The verse can be on any topic. All submissions should be emailed to LAFFCONstaff@gmail.com. Entry deadline is Thursday, April 25, 2019. Contest entries will be judged by the LAFFCON Planning Committee (who have little expertise with poetry but a great deal of experience with clever but mean-spirited shenanigans). 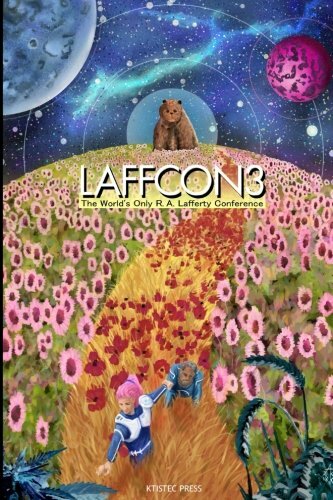 Winners will be published in the LAFFCON4 Conference Booklet, free to all who attend LAFFCON4 on June 8, 2019, and will later be made available for purchase via Amazon.com. No royalties are payed to contributors. However, each winner will receive a contributor copy of the booklet. Aside from publication in the LAFFCON booklet, all rights to the submission are held by the author. LAFFCON is a free event open to the public and there is no fee to enter the Bagarthach Verse Contest. How weird are the ways of Earth! "I ask the same question," Henry said. "From my viewpoint, I'm the man, you're the alien. How weird are the ways of Earth! Or as it is written, 'Can anything good come from Earth?'" Are we good? Has anyone in the Universe noticed yet? Have the Puca noticed? We're definitely going to have this party again in 2019. LaffCon4 - June 8th, 2019. What will we do at LaffCon this year? "It was in this big room that the dead people would gather and sit and talk when they were tired of lying in one position. They cracked old bones to get the marrow, and they drank corn beer. It didn't take much eating and drinking to keep them up, since they were no longer fleshed. They didn't eat much, but they sure did smoke a lot. It is not generally known, but dead people used tobacco for centuries before live people stumbled onto it. That had also been the case with the Puca. The smoke all came out through a hole in the side of the mound, and that caused the fog or haze. The children learned the interior of the mound. They could have hidden there from all pursuit, but they couldn't have taken their rafts there. They dug all over the flanks of the mound, and came out with bones of animals and people. They dug out two prime skulls which they set up on the prows of their rafts. The children formed enduring friendships with many of the old Indians in the middle of Misu Mound. They learned a lot about Earth people from them, how they are in their essence, what are the real things that are hidden under the daily exterior, and how it was in the old days. And they learned the right way to cure tobacco and to make pipes and how really to smoke up a storm." The best idea so far for LaffCon4 is that we sit and talk when we're tired of lying in one position. I'm fairly sure that old bones will be cracked throughout the day (all that lying and sitting and talking is rough on our old bodies). We'll get down to the marrow. If I can convince Rob to convince the library to change their policies, then there will be much corn beer and tobacco use throughout the day. Or perhaps that will wait until the evening. Or perhaps corn beer and tobacco have fallen so far out of favor on Earth that these things won't happen at all. Throughout the day, I hope that we will learn a lot (maybe even just a little) about Earth people. We may learn how people are in their essence. We may learn what the real things are that are hidden under the daily exterior. We'll let the old-timers tell us how it was in the old days. And maybe during the breaks or maybe if we stay long enough into the evening, we might have a how-to session on really smoking up a storm. --a panel on "Groaning Hinges of the World". There are a couple of other possibilities in the planning stages, but nothing that is definite. If you would like to present a paper (or sing a song, or dance interpretatively, or recite the epic poem about Tulsa that you've been working on), then please contact us: laffconstaff@gmail.com. Anything Lafferty-related is welcome. YOU are welcome. Please join us. “Most of the panels were good. And a person who likes to ask questions could really let himself go on almost any of them.” -R.A. Lafferty, from "The Gathering of the Tribes"
We're getting better at this con game every year. LaffCon3 was better than LaffCon2 was better than LaffCon1. One significant improvement that we made this year was in the quality of our audio recording. We haven't meant to be secretive. We fully understand that many of our fellow Lafferty fans are spread out across the globe and can't possibly make it. All of our attempts at recordings and streams have been for these fellows. Last year's video recordings of our attempted live stream are too embarrassing to share. They can still be found if you search for them, but I won't proudly point anyone to them. The contents of the lectures/panels are great. The video recordings not so much. It turns out that Laffertian bi-location is harder than it appears. This year we enjoyed the presence of Glenn McDorman and Brandon Budda, the hosts of The Gene Wolfe Literary Podcast. These two classy gentlemen put on a great live show at the con. They were also tremendously helpful in getting professional quality recordings of much of the rest of the con. Thank you, Glenn and Brandon. Stay tuned to their podcast feed for some great audio from the con, then stick around into the future as they dive into Wolfe's The Fifth Head of Cerberus. The "Snuffles" episode featuring our very own Gregorio Montejo dropped today. Planning is underway for the fourth mutation of the one and only conference dedicated to the life and works of author R. A. Lafferty.